Gary Preston, Chris Anderson, David Parker, Danny Miller, Kim & Sandy Prestwood. And a special thank you to David McCullers. Along with style, conformation, and pigment the 551 bull delivers performance. The 416 bull is siring vigorous, growthy, well pigmented offspring. His daughters are in production at Southwest Turf in Texas. Terry Jungman is very pleased with those heifers. 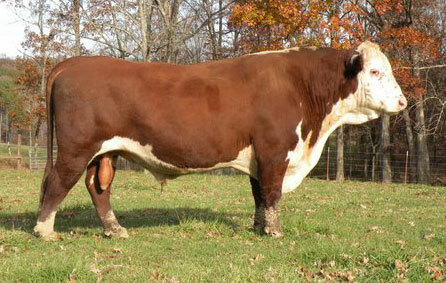 The 8017 cow is a top producer at Crooked Lake Ranch and is the dam of several other herdsires. The EPDs and carcass data indicate that this is an elite Victor sire. Proof of the great ability of 360 to provide extreme thickness. Thanks to Chris Anderson, Gary Preston, and Danny Miller for their confidence in this young bull. 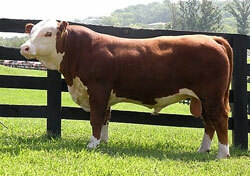 We feel that 360 will prove to be the Victor Domino sire of the future in the Hereford breed. He is long, thick, and well muscled. 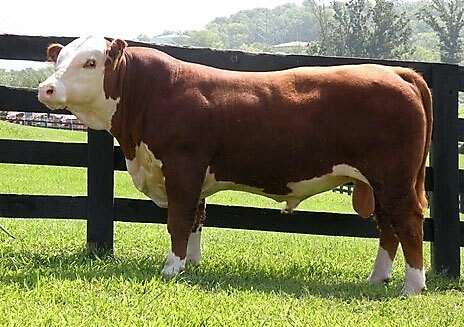 A face full of freckles along with eye and scrotal pigment makes him an appealing Hereford bull. 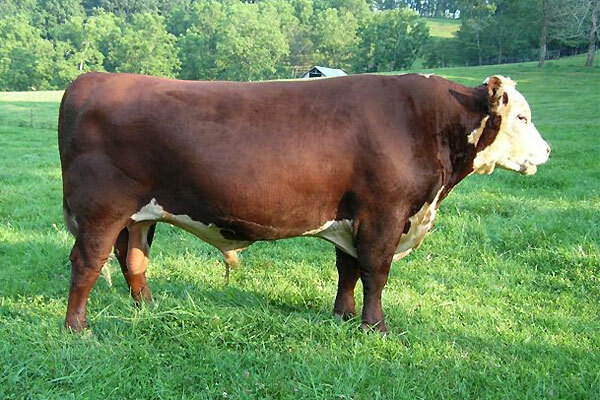 Grand-dam, Y17, resides at Highridge Farm. She is 17 and just weaned twins. 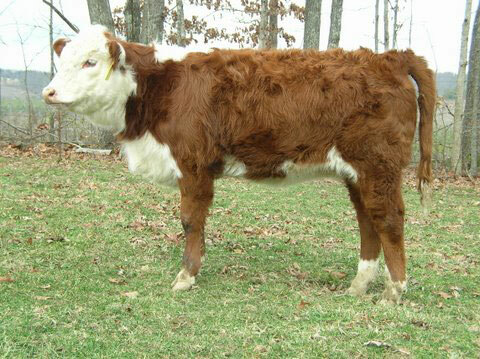 She is undoubtedly the finest Polled Hereford cow that we have had the privilege to own. 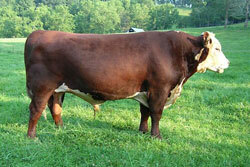 The sire of 360 is the famous 229 bull from Mr. E.D. Raulerson's Briar Creek Farm in Georgia. 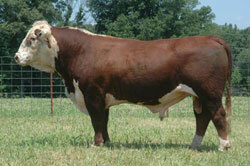 EDR 229 was heavily used nationwide and was selected by DuVall Ranch in Colorado as one of their main herd sires. The first calves born sired by 360 have created quite a stir. 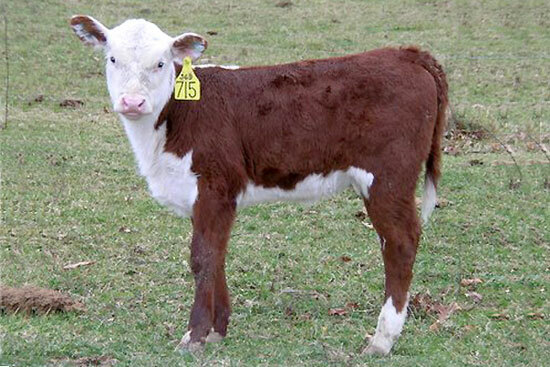 They have correct conformation and are growthy calves. 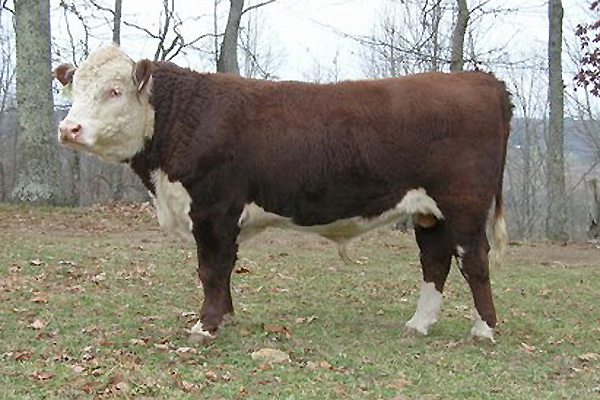 Herd sire, 369, exemplifies the modern kind of Polled Hereford bull. He has the size, correctness, and eye appeal to make him popular. 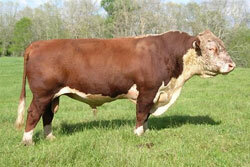 The dam of this bull resides at Highridge and is still producing good calves at 17 years of age. She has earned Dam of Distinction status within the American Hereford breed. The sire of 369, K120, needs no introduction. He is one of the most popular Polled Hereford sires to leave Oleson Ranch and is one of the finest progeny of the great F243 bull. Calves by 369 have been consistent in their quality. We have calved several heifers without difficulty. These calves have good eye-pigment, structural correctness, and are showing tremendous growth. The first daughters of 369 have now calved.